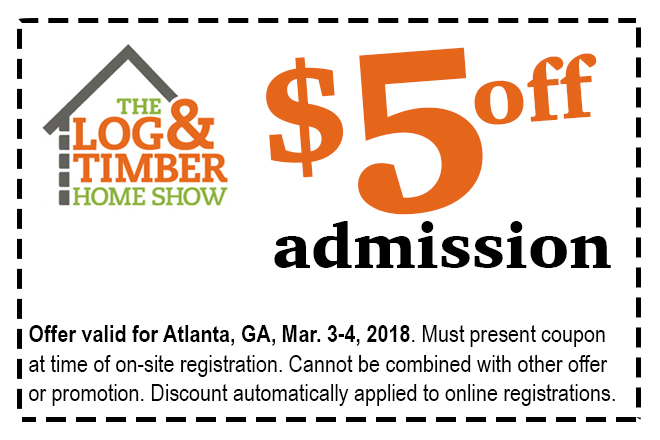 The Log & Timber Home Show will be returning to host the Atlanta, GA Log & Timber Home Show on March 3-4, 2018. Ask your questions of industry experts in a one-on-one environment. Browse rustic decor and buy items off the showroom floor. 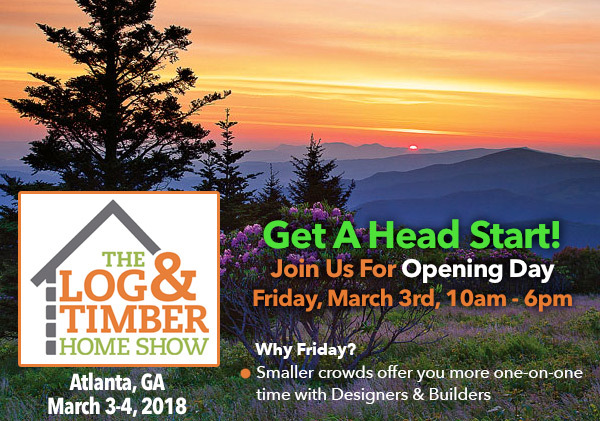 Bring your floor plans and break ground on your dream Log or Timber Frame Home at the Atlanta, GA Log & Timber Home Show: March 3-4, 2018. What you can see and do at a Log and Timber Home Show: Meet with builders, and log and timber home companies face to face to ask questions. Attend a Log and Timber Home University. (Find out more about the Log & Timber Home University by clicking here). Listen to informative workshops presented by experts Plus, you just might meet an editor of Log Home Living, Cabin Living or Timber Home Living Magazine! You may want to consider the Atlanta, GA University Course held in conjunction with this Show on Saturday, March 3. Regular Show Admission (Full weekend) $15 each online or print this coupon to use at the door / $20 each at the door (18 and under are FREE) or print this coupon to receive $5 off each ticket purchased onsite. Note: 1 Coupon per group. Cannot be combined with other offer or promotion.